Some holidays are meant to be celebrated with flair, and today is indeed one of those days. National Peanut Butter Day ranks right up there with Christmas and Thanksgiving in my book, and remains a "holiday" that I sometimes entertain celebrating daily. If you are a familiar reader of Liv Life, you may remember a peanut butter recipe or two... those Peanut Butter Waffle Sandwiches are still being requested by my carpool girls, along with the PB Granola which also remains favorite. Peanut Butter Krispie Treats? Well they've earned the third spot on our list of all time viewed posts. Apparently I'm not the only one with Peanut Butter love. As such, we most certainly couldn't let National Peanut Butter Day go by without a peanut butter treat, and with chocolate also pretty darn high on our happy scale, why not go all out and put the two together?? 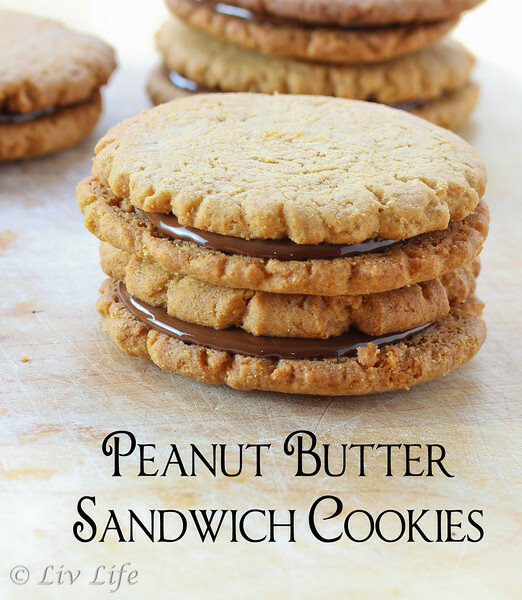 Enter Fine Cooking's recipe for Peanut Butter Cookie Sandwiches by one of my favorite bakers, Abby Dodge. I don't think I've found a recipe from Abby that I don't love, and the well worn page in my October 2007 Fine Cooking magazine evidences that this one is no different. Being a dairy as well as gluten free recipe, this one meets the requirements of my lactose intolerant son and has him smiling and eating without worry. For those not needing gluten/dairy free conditions, you'll never know the difference. Actually, when we started making these my family had no dairy issues, so the recipe was simply made out of pure peanut butter love. 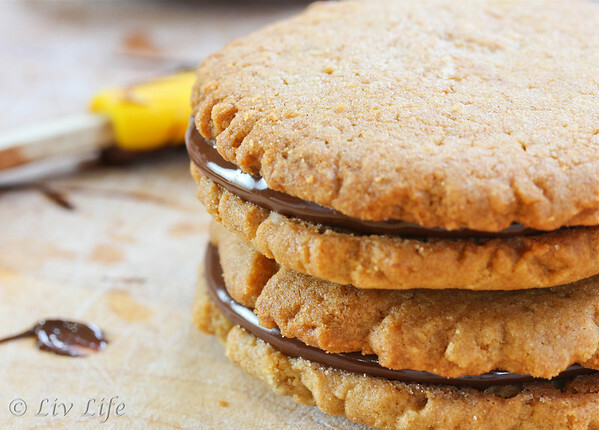 Pure peanut buttery taste shines in this flourless cookie, and the bite becomes ever so addicting as the chocolate center sets up, bringing an irresistible creamy crunch that surprises that palate. Described in the reviews on the Fine Cooking site as "The ultimate last meal cookie", I don't think there is anything further I can add. Happy National Peanut Butter Day 2013! Light, crispy cookie meets a creamy chocolate filling for the ultimate Peanut Butter Sandwich Cookie. Preheat oven to 350º and line a cookie sheet with parchment or a silicone mat (or use cooking spray). Place peanut butter, brown sugar, and baking soda in a medium bowl or the bowl of a stand mixer, and mix on medium speed until well blended. Add the eggs and vanilla and continue mixing on low just until blended... about 25 seconds. Roll tablespoon sized balls of dough, about 1-inch in diameter, and place on the prepared baking sheet about 1 1/2 inches apart. Abby does not recommend pressing down, but I prefer a thinner cookie for sandwiches and press the balls flat with the heal of my hand - proceed with your preference. Bake one sheet of cookies at a time in the preheated oven for 10-11 minutes. Remove from the oven and allow to cool completely on the baking sheet before removing. For the filling, melt the chocolate, peanut butter and butter (or butter alternative) in a small saucepan or double boiler over low heat on the stove, stirring until smooth. Remove from the heat and allow the chocolate mixture to cool until thickened (about 20 min). Turn half of the cooled cookies over so they are flat side up. Spoon 2 tsp. of the chocolate filling onto the center of each cookie. Top with the remaining cookies, flat side down. Press gently on each cookie to spread the filling almost to the edge. Set on the rack until the filling is firm, 20 to 30 minutes. 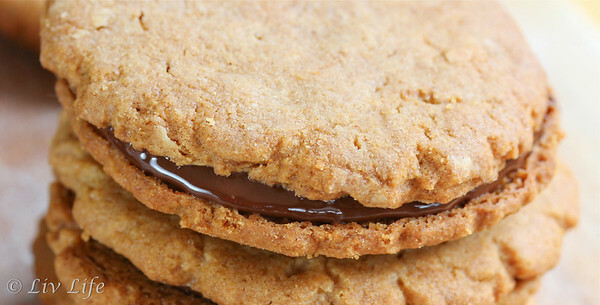 These cookies look like the perfect way to celebrate national peanut butter day! Oh my word, I am in love. I saw these pop up on Facebook and I literally giggled with excitement. I am pinning these beauties! Best day of the year!! Although it's peanut butter day every day in my world. Seriously. 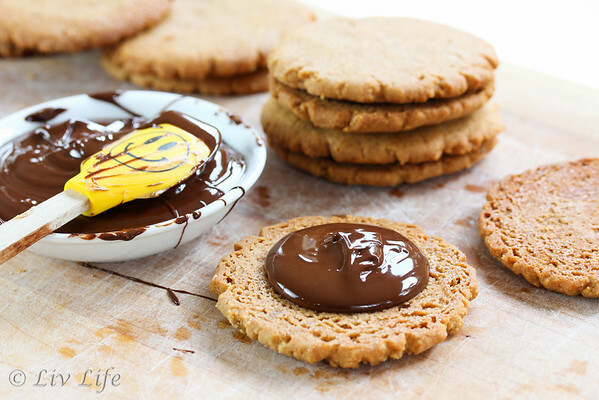 If I were that spatula nestled in the peanut butter ganache, I'd be smiling too. You rocked it Kim! For these cookies, I'm going to send some sunshine your way. PB is worth celebrating every day, but hey: I'll take any excuse to make these cookies! They look just wonderful. The ganache really must take these to a whole new level of heaven. 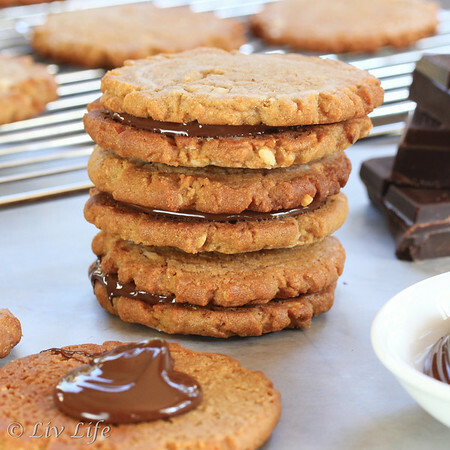 These are some good looking cookies and I love that you use peanut butter in the ganache too! I would have never thought of that! I think the day you published this post I happened to watch a Tevo recording of an ATK episode featuring peanut butter sandwiches---I've thought of them since! I've always been happy with Fine Cooking recipes I've come across--I bet these are awesome. They're beautiful! These look wonderful. Pinning now! As someone who loves dairy and gluten, I admit that we could probably all benefit from eating less of these things. This recipe doesn't look like it's lacking anything at all. What a nice surprise. This would be a great edible gift for those situations when you're not quite sure what food allergies people have...well, as long as you know they're not allergic to nuts! GORGEOUS!!!!! What a great sandwich cookies....I need that in my life! Beautiful Kim...just beautiful! What a way to celebrate Peanut Butter!! Beautiful! We made the top 9 together! Beautiful cookies! You are making me hungry. Congrats!